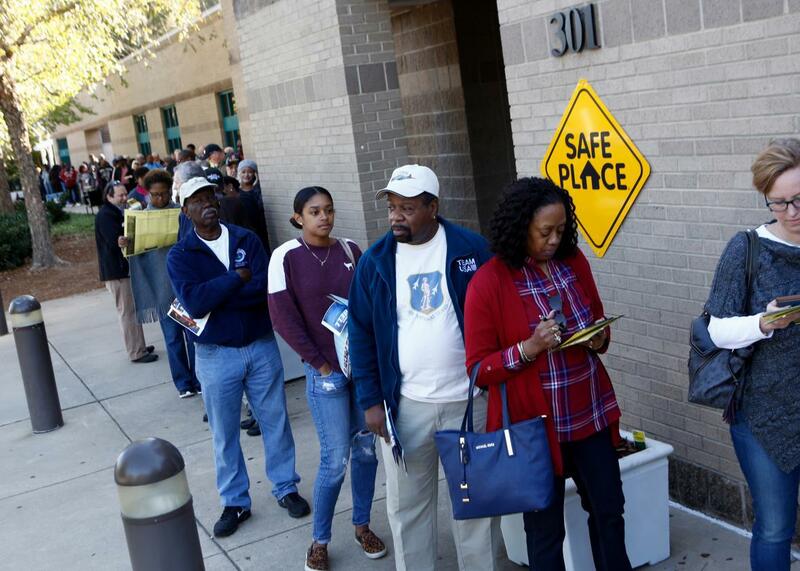 Those insanely long early voting lines were a result of Republican voter suppression. North Carolina residents wait in a line to get into the Charlotte Mecklenburg University City Library to early vote on Oct. 24 in Charlotte, North Carolina. Millions of Americans eager to cast a ballot before the Election Day rush have stood in gallingly long lines during early voting as their overstuffed polling places struggled to accommodate increased demand. In a way, the lines were a nice symbol of democratic engagement, proof that citizens remain engaged after a miserable election season. But they also represented something much darker: voter suppression. Contrary to the suggestion of some election boards, these endless lines were not a fluke or a surprise. They were a direct result of the Republican Party’s recent, coordinated assault on voting rights. Consider North Carolina, the epicenter of GOP voter suppression. Just days after the Supreme Court gutted the Voting Rights Act in Shelby County v. Holder—thereby allowing the state to restrict voting without federal oversight—the overwhelmingly Republican Legislature requested data of voting preferences by race. The legislators then promptly passed an omnibus bill that, in the words of the U.S. Court of Appeals for the 4th Circuit, “target[ed] African Americans with almost surgical precision.” A key provision of the new law slashed early voting, including several days of Sunday voting, which black voters favored. As the state explained in court with startling candor, “counties with Sunday voting” were “disproportionately black” and “disproportionately Democratic”—a fact that persuaded the Legislature to severely cut back early voting. In July, the 4th Circuit blocked this legislation from taking effect this election cycle, holding that it violated both the Voting Rights Act and the Equal Protection Clause as a race-based voting restriction. But Republican-controlled county election boards implemented the early voting cuts anyway. (These boards retain power over county-level voting practices and claimed they had decided independently to roll back early voting, not implement the now-blocked law that did the exact same thing.) The boards colluded to cut early voting—and Sunday voting especially—in Democrat-heavy areas, as GOP election board chairmen urged each other to follow the “party line.” When one Republican chairman agreed to open a Sunday voting site where black voters could cast ballots after church, his fellow GOP chairmen called him a “traitor.” The transparency of these suppression efforts is staggering: On Sunday, the North Carolina GOP boasted that black early voting is down this year, when that fact is almost certainly attributable to Republicans’ own attack on black voting. Ultimately, North Carolina counties cut an astonishing 27 voting sites altogether this year and dramatically reduced early voting hours in many of the remaining sites. The result was entirely predictable: monstrously long lines that force voters—many of them elderly—to stand outside for hours upon hours just to cast a ballot. As the Nation’s voting rights expert Ari Berman has reported, the story is similar in other states previously covered by the Voting Rights Act, including Texas (403 poll closures since Shelby), Louisiana (103), and Alabama (66). The problem is especially acute in Maricopa County, Arizona, which, as Berman reports, “reduced the number of polling places by 70 percent from 2012 to 2016, from 200 to just 60—one polling place per 21,000 registered voters.” And in Ohio, GOP-instituted cuts to early voting in Cincinnati created a half-mile line of 4,000 people that snaked under an interstate and through a public park. These endless lines are a symptom of voter suppression, and those who suffered through them are victims of the Republican war on voting rights. Our current crisis was carefully planned and plotted by GOP activists, officials, and politicians across the country, and set in motion the day the Supreme Court declawed the Voting Rights Act. It is now clear that one major political party has dedicated itself to suppressing as many minority votes as possible. What we are witnessing this election season is the fruits of that labor—the incontrovertible evidence that the right to vote is more imperiled in America today that it has been in half a century.